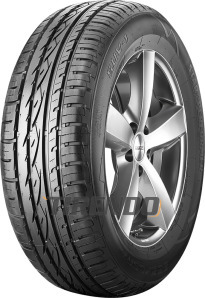 Due to their favourable price and good performance, summer tyres Star Performer SUV 1 are listed as economic tyres. The tyres are available in sizes from 16 to 21 inches suitable for larger cars, such as jeeps and SUV cars. The quality Star Performer SUV 1 summer tyres optimum adhesion and stability on any road surface, both wet and dry. Wide grooves and massive tread blocks ensure safety and precise handling, especially in the curves. This summer tyre is exclusively distributed by Delticom AG and is specially designed for SUVs and off-road vehicles. What separates an SUV from other cars is usually several important things, such as stronger engine, four-wheel drive and a higher weight. This, in turn, places special demands on the tyres. With the Star Performer SUV 1 summer tyre , you can make sure you use the full potential of your car. It is available with rim protection as well as in enhanced versions and, depending on the tyre size, can reach the speed up to 186 mph. Precise steering and safety are supported by hefty tread blocks and wide grooves, particularly when cornering. The risk of aquaplaning is significantly reduced due to the efficient water disperse from the tread. The level of noise is also reduced while driving comfort is increased. Star Performer is an Asian tyre company that has succeeded in combining low price and good quality. The company now belongs to Nankang, Taiwanese tyre manufacturer who continues to impress both the Asian and European markets. Knowing this Tirendo.co.uk offers you a lifetime warranty when you purchase one of the available Star Performer tyre models. If your tyre gets damaged for some reason, according to the tread depth at the time of assessment, we will give you a replacement tyre of the same brand. For instance, if at the time of assessment the tread depth is between 5.0 and 5.99 mm you will receive a discount of 80% when purchasing a new Star Performer tyre. Order Star Performer SUV 1 today on Tirendo.co.uk and take advantage of a particularly low price and the lifetime warranty. Note that we also stock other good products for the car, such as complete wheels and car accessories at reasonable prices.